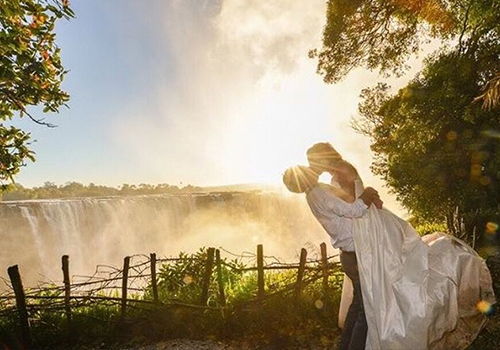 Victoria Falls is a dream wedding destination. Every detail of your ceremony and reception is tailor- made by our team of professionals to suit your needs – be it beside the Victoria Falls, on the banks of the Zambezi River or at sunset overlooking a wildlife-rich waterhole at Victoria Falls Safari Lodge. Our team is happy to plan and take care of all arrangements for your wedding ceremony and reception to make your special day perfect. 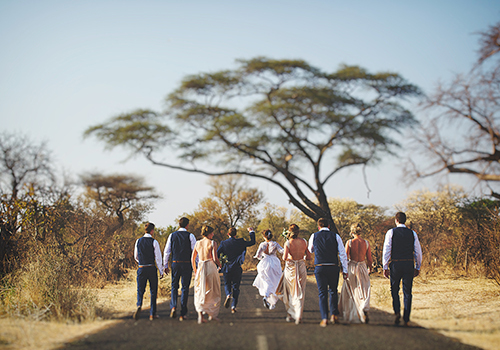 The sunset- facing Victoria Falls Safari Lodge resort has several great venues for both wedding ceremonies and receptions, but your nuptials may also take place at a range of locations off the property. Victoria Falls Safari Lodge’s library – situated at the topmost viewing point of the lodge and overlooking the waterhole. At sunset, this private venue offers a beautiful setting for a memorable and intimate ceremony for up to 15 people. Victoria Falls Safari Lodge amphitheater – this open-air venue with a leveled stage and surrounded by terraced grassed banks is the largest venue on the resort, comfortably accommodating 200 people. The Indaba Conference Room – this thatched A-frame building opens onto a small balcony overlooking the African bushveld with a view of the spray of the Victoria Falls. It can accommodate 100 people. Nandi Gardens – located in the grounds of Victoria Falls Safari Lodge, this venue is ideal for a reception under the stars, and can accommodate 100 guests. The Indaba Conference Room – this venue lends themselves well to a reception never to be forgotten. It seats 70 guests for dinner or 40 guests with a dance floor. The Boardroom – with a view over Zambezi National Park including the resort’s wildlife-rich waterhole, it can accommodate 20 guests for a gala dinner. The Boma – which celebrates superb game dishes and local traditions, may be booked exclusively for large groups (minimum of 250 guests), or smaller groups may book one of the Boma “villages”. MaKuwa-Kuwa Restaurant – partially open-air and with excellent views over the resort’s wildlife-rich waterhole, may be booked exclusively if 60 to 80 per cent of the wedding guests are staying at Victoria Falls Safari Lodge. In the African bush – celebrate your marriage in the wilds under the stars. Other onsite options may be discussed with our team. On the banks of the Zambezi River, one of Africa’s largest and most beautiful rivers. Begin your married life surrounded by bush, and possibly some wildlife! On the Zambezi River – on a cruise boat gently drifting down the river. The Elephant Wallow – located in Victoria Falls National Park, The Wallow, part of the Wild Horizons Wildlife Sanctuary, can accommodate 100 guests. Interaction with the elephants may be arranged on request. Victoria Falls Rainforest – details available on request.